Terry Tempest Williams is one of my favorite environmentalists and authors. I was initially enthralled with her book Refuge. I am currently moving my way through her book The Hour of Land A Personal Topography of America’s National Parks. While I would like to say I read for pleasure at all times of the day and night – I actually read at night before I fall asleep, and deliciously consume books when I travel and while on vacation. Some books, even when I’m reading for pleasure, I find myself highlighting things or writing in the margins, even at midnight. This book is no exception. But as I hiked along with the author through Effigy Mounds National Monument, suddenly, as if my shoe had caught on a root – I tumbled into something so familiar and profound I hurried to reach for my pen. I was less than 3 months in my new job when I heard The Second City and Caring Across Generations reps say at a conference that they believed they had a good idea – to use Improvisation with family caregivers. They said all the things Terry Tempest Williams said above, in a slightly different package. 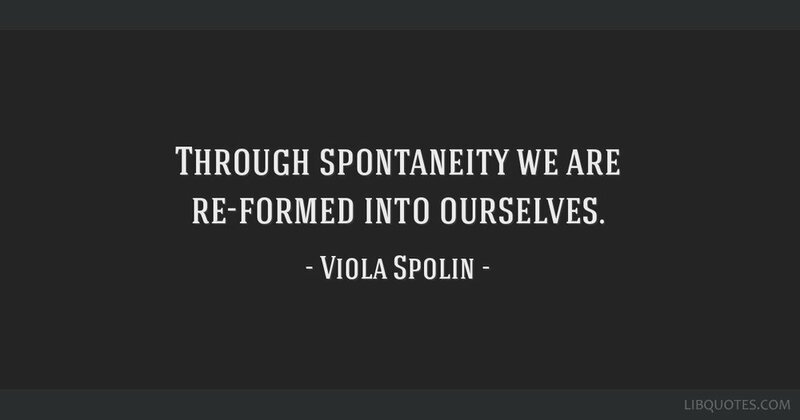 The mother of Improv, Viola Spolin, taught refugee children games in the early 1900’s, to build community, and friendships and hope – needing something other than language as they didn’t have a common one between them. She was part of the Hull House in Chicago, tied to the origins of social work in this country. Especially when we work with or care for people with memory loss, our capacity to remain present with them, and to over time journey with them in that same space, in whatever short term memory span they have – can mean a kind of survival for them and those of us who love them. We get good at just filling in the blank when their brain misfires, we learn to play 20 questions or 100 and try to let go of whatever our agenda might be – because really, nothing is more important than what we can do and be together. This new normal for many people can find them in a land and a landscape unfamiliar, and really, don’t we just need the familiar and predictable comfort of each other when we feel like we suddenly are isolated and alone? The good news is we can control the world around us and our loss of what we used to know and do with our loved ones by creating something new, and we have all the stuff we need. Our Improv for Care class we created seeks to help caregivers feel good about their “improbable and sustaining gestures”, and appreciate the incredible “moments of grace” when they have taken that control to let go and play with their loved one, listening hard for what they might be saying or being willing to ask them about the last thing they said, whether it makes sense or not. If you are a caregiver, you could probably list quickly all the things on your to do list, both caregiving and otherwise. Who is in your ensemble? Who is around you that can take some of that for you so you can get to the “doing, the being, the becoming” with your loved one? Take an Improv class. Go see an Improv show. We’ve got some of the best in Las Vegas, or go to the mothership in Chicago and see The Second City. Read more about it, and ponder how you and your family can set something magical, something “inexplicable into motion”. Parkinson’s and Dementia can’t take our love from us – even as it seems to tear at our very being. We are stronger and we will, as the author says “continue to evolve and transform who we are in relationship to where we are”. Improv is a fantastic vehicle to help us get there, and be there in that place together. And we are equipped for wherever this goes. A principle of Improv is saying ‘yes, and…”. It allows actors to create a scene based on “where they find themselves” and what the other actors say. If you are creating a scene, with only what you have in front of you – you can’t tell your fellow actors “no”. The scene will end. But we are powerful people with a strong and deep love for our loved ones living with the challenges of Parkinson’s and maybe dementia. So we say “yes, and…” which only builds on what you have in front of you. It allows you to make something new, builds the story, between and among you. You have people, you’ve got mad skills, you’ve got big love! And those moments of grace will take care of you.